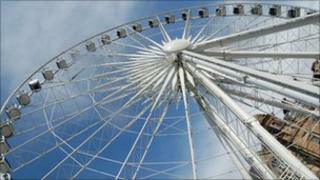 Sheffield City Council has confirmed that The Wheel of Sheffield is leaving the city three months early. The landmark attraction has been at the top of Fargate since July 2009. More than 100,000 people went on it in the first six months and the council gave permission for it to stay until January 2011. The council said was looking at plans to replace it with a Christmas attraction and details would be released in the coming weeks. Councillor Roger Davidson said: "We believe the Wheel of Sheffield has been a success in the city and a welcome addition to our skyline. "Its stay in Sheffield was always a temporary arrangement which has been extended beyond the original timescale of six months and we appreciate and accept its owner's decision to move it to a new location so it can be in place for Christmas. "We are currently looking at plans to replace it with a Christmas attraction once the site is vacated and will reveal further details in the coming weeks. "We'd like to thank Great City Attractions for choosing Sheffield as one of its recent UK sites."